In the wake of this announcement, many people may be concerned about replacing their pump. Some pump companies are offering chances to purchase their pumps at reduced prices or other beneficial ways. For instance, Accu-Chek Alliance Program offers an easy and affordable transition to a brand new Accu-Chek Spirit insulin pump system. The feature rich Cozmo® insulin pump has an ergonomic look and feel similar to a Nokia phone. It is the lightest mainstream pump available, weighing 77 grams without reservoir or insulin. Its height and width are smaller than the Paradigm, but it is slightly thicker than other pumps. The Animas IR1200 is smaller in total size with its 200 unit reservoir. The Cozmo is easy to program and features no-look boluses, easy IR connection to a PC for downloading data, a 300 unit reservoir, nonproprietary infusion sets, and power from a single AAA battery that lasts about three weeks. The Cozmo, released in 2002, was designed with plenty of memory to allow additional features to be added later. 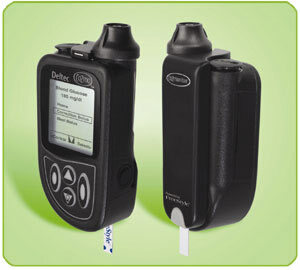 In 2003, a software upgrade allowed Deltec to be the first company to attach a glucose monitor their pump. They partnered with Abbott Diabetes Care to introduce the CoZmonitor blood glucose monitor. The pump-meter combo is called the CozMore. The CoZmonitor meter, attached to the back of the pump, uses readily available FreeStyle® test strips. The CozMonitor meter was provided as a free add-on, along with a quick software upgrade that allowed the pump to operate the meter and keep track of several weeks of blood glucose data. This is currently the only all-in-one insulin pump and blood glucose monitoring system. Blood glucose entries are directly used to calculate appropriate bolus doses, especially when insulin on board is present. 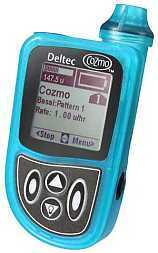 The Deltec Cozmo® pump keypad and screen are used for all blood glucose testing functions and results. Although the small meter increases the thickness of the pump, it eliminates the need to carry an additional meter device. The CozMore fits into a leather carrying case that clips onto a belt or skirt, but many users prefer to slide it into a medium, open-top cell phone case. Programming options abound: reminders or alerts can be set for taking boluses at certain times of the day, to alarm an hour to four hours after boluses or after low or high blood sugars, or to replace your infusion set in three or four days at a particular time of day. The user or physician can set the pump to deliver normal unit-based boluses (0.05 unit steps in both boluses and basals, if desired), preset boluses for a preselected number of carbs for each meal of the day, preset boluses for specific meals such as 3 slices of cheese pizza, or boluses based on the actual carb content of meals and snacks. 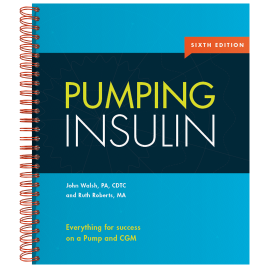 Individualization allows you to name your pump and set up personalized carb factors for breakfast, lunch, and dinner, if you wish, as well as your correction factor or point drop per unit of insulin. Other subtle features include a hidden amount of insulin, so that when the reservoir volume reaches "0.0 units", it actually has a reserve of over 10 units available to continue basal insulin delivery for several hours. This avoids the abrupt stoppage of basal delivery that can occur in other pumps. How long a bolus of insulin works for you can be programmed to allow the Cozmo to recommend bolus reduction when a subsequent bolus is taken while insulin is still active from a recent bolus. With your physician's help, you select how long boluses lower your blood sugar by setting the duration of insulin action time from 2 to 8 hours. Values at the extreme ends of this range can introduce control problems because this duration affects bolus dose calculations when active insulin or BOB is present. To find out why this wide range creates problems, read our article on the Duration of Insulin Action: A Very Important Pump Setting. 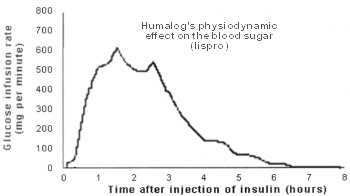 For Novolog, Humalog, or Apidra insulins, most Cozmo users would select between 4 hours to 5 hours and 15 minutes for their action time (see graph of Humalog action to the right). In one study of Novolog, a 19% variation in the time insulin takes to peak can be seen from one person to the next (Diabetes Care #11: pgs 1910-1914, Nov 21, 1998). This means that adjusting insulin action makes sense, but a 19% variation suggests that the insulin duration time would vary by only about one hour, not the wide range of 2 to 8 hours that is offered in all the new smart pumps. Flexible times for insulin action makes sense but care in selecting this time is critical for good control. When a premeal bolus is given with the Cozmo, you enter the number of carbs you plan to eat into the pump and if a glucose test is done it is automatically entered. Entering the current blood sugar allows any Bolus On Board (BOB) that is present to be calculated into the recommended bolus. This bolus recommendation can then be modified as you wish for extra activity or other factors. The Cozmo software enables easy, advanced programming of the pump from a PC with an IR port. One feature original to the Cozmo pump and adopted by the the Paradigm 515/715 it is that each type of insulin is tracked separately. Basal insulin, carb boluses, and correction boluses are individually tracked so that the wearer can see what percentage of their insulin is coming from each type of insulin. For instance, if 25% of the insulin is coming from correction boluses, it becomes obvious that more basal or bolus insulin is needed or that there may be a problem with forgetting carb boluses before meals (luckily, there is a reminder to correct this type of forgetfulness). A good goal is to keep correction boluses below 8% to 10% of the TDD. Smiths Medical has taken a unique approach to pump upgrades, using Flash memory to ease the process. Instead of a $200 to $400 charge for an upgrade, Smiths provides these software improvements at no charge. Their first software upgrade was provided at the time the CozMonitor was introduced. A second free upgrade with additional pump features began in the fall of 2006. A replacement pump is sent to the user and their pump is sent to Smiths for the software upgrade as well as a complete cosmetic redo. New options in the recent software upgrade include a Quick Start Guide, a Weekly Schedule, a Therapy Effectiveness Scorecard, a Disconnect Bolus, Custom Meal Boluses with Default Carb Amounts, a Basal Test, a Low BG Manager that recommends how many carbs to eat, and a Food Bank. We do not yet know whether the Super Bolus or Intelligent Timer will be featured in this package. The Cozmo body is well designed. Although not a common problem, like other pumps, it can be damaged by a very hard fall onto hard surfaces like concrete. Repairs and replacements are generally free. Overall, mechanical dependability and ease of use for this pump are excellent. The Cozmo is made by Smiths Medical MD, Inc., formerly Deltec, Inc. Located in the St. Paul/Minneapolis area and part of Smiths Group plc, London, the company was founded in 1983 by developers of the original CPI insulin pump after that pump was purchased by Lilly. After becoming the world leader in medical delivery pumps for chemotherapy, pain medications, and other uses, Deltec received FDA approval and released the feature rich Cozmo® insulin pump in 2002.